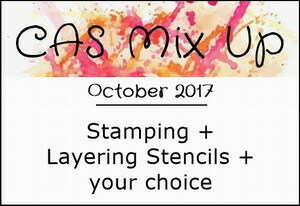 A fun time is currently happening at CAS Mixup October Challenge to use Stamping, Layer Stenciling plus choice. Hope you're having an enjoyable day ... thank you for visiting and commenting ... always appreciate your feedback. What a creative use of stencils, Marilyn! I love this butterfly! All the stenciled details make the colors and markings beautiful and the embossing adds even more detail! Thank so much for sharing this with us at CAS Mix Up! You have used a lot of techniques and still managed to create a CAS design. Awesome! Great mix of stencils ... your butterfly is really beautiful. Thanks for sharing with us at CAS Mix Up! Such an imaginative and creative way to use your stencils and achieve a CAS card with lots of techniques! I love it! Thanks so much for joining us at CAS Mix Up! Thank you, Robyn. A big congrats to you for last month's selection. Love the white silhouette foliage against the gorgeous colored background. Oh my goodness!! Your card is fantastic ! Live in sunny southwest Arizona.